Shhh... 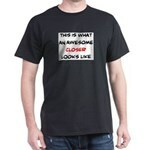 I'm Binge Watching The Closer T-Shirt - Binge watchers of The Closer can use this design to show some love. Makes a fun gift! Police Lie White T-Shirt - You cannot trust the police. They lie about everything. A funny quote from The Closer Brenda Lee Johnson. Closer TV White T-Shirt - I'd rather be watching The Closer. I love watching Chief Brenda Lee Johnson solve crimes.